PLO official: Israel is trying to "flood the Palestinian street with drugs"
"flood the Palestinian street with drugs"
Calling for a national campaign to fight drugs, Ayyad stated that there are "frantic attempts to turn Palestine into a producer of this destructive plague by turning agricultural lands into nurseries of death for the production of drugs:"
"During his meeting with Head of the General Directorate for the War Against Drugs in the police forces Abdallah Aliwi yesterday, Ayyad added... the frantic activity to which we are witness recently of criminals that are planting drugs in most of the districts, in addition to the efforts of the occupation and criminal drug dealers to flood the Palestinian street with all types of drugs and to make it easier to obtain them through low prices, constitute a dangerous sign that necessitates the enlistment of all of the government and civil sectors, and also of the factions and clergy, in order to come out against the destructive war that has been declared against the Palestinian people." Last month, the head of the PA Preventive Security Force Muhannad Abu Ali similarly blamed Israel for being responsible for the growing of drugs and drug use among Palestinians. 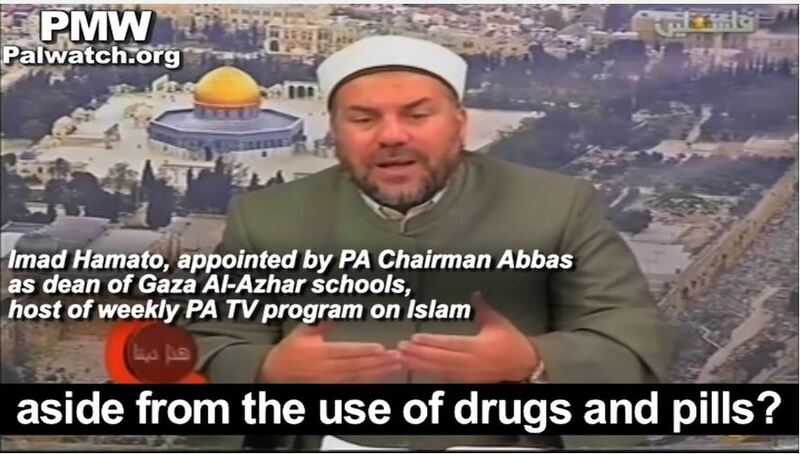 The PA has blamed Israel for the Palestinian drug problem for years and even accused it of urging drug use among Palestinian youth in order to destroy it, as reported by Palestinian Media Watch. Headline: "The [PLO] Commissioner of Public Activities called for a national campaign for the war against drugs"
"Commissioner of Public Activities in the [PLO] Political and National Guidance Authority Nasser Nimr Ayyad called for a comprehensive and continuous national campaign for the war against the plague of drugs and the frantic attempts to turn Palestine into a producer of this destructive plague by turning agricultural lands into nurseries of death for the production of drugs. He also said that the war against this destructive plague is a national, religious, and moral obligation. During his meeting with Head of the General Directorate for the War Against Drugs in the police forces Abdallah Aliwi yesterday [Aug. 30, 2018], Ayyad added... the frantic activity to which we are witness recently of criminals that are planting drugs in most of the districts, in addition to the efforts of the occupation and criminal drug dealers to flood the Palestinian street with all types of drugs and to make it easier to obtain them through low prices, constitute a dangerous sign that necessitates the enlistment of all of the government and civil sectors, and also of the factions and clergy, in order to come out against the destructive war that has been declared against the Palestinian people."